« October a month of wedding cakes…………. At this time my kitchen is filled with holiday fragrances and aromas that allow memories come to mind when I was a child. Tante Julka, my great aunt, was a gifted baker and specialized in small pastries. She lived in Croatia, Europe, before the 2nd WW. She did not have a refrigerator, as no one else did, to store her many wonderful cookies days and weeks before the holidays, instead she kept them in two drawers of her breakfront in the dining room, lined with foil, to keep them cool. She actually saved the wrappers of chocolates, and when she had enough she lined her pastry drawer with them. Now that I think about it…she must have eaten a lot of foil wrapped chocolates……..! Can you imagine how hard it was to choose just one cookie among so many? Therefore, when I had my son, I vowed that I would never do this to him because there were other ways that I found helpful in teaching him about making a difficult decision in life. To choose one cookie was not quite my way of helping him to grow up. Holiday baking is a fun time in Maja’s Kitchen! I start baking sometimes in late fall and finish just about a day before Christmas Eve. During all this time the aroma that permeates my kitchen is primarily Cinnamon! Not because Cinnamon is the spice I use in every recipe, but because it is one of the strongest aromas or flavors one can use in baking. Cinnamon is one of the most ancient spices in the world. It has been touted as an aphrodisiac by The Queen of Sheba who brought it to King Solomon and enveloped him in its warm and sensuous aroma, but he also knew that Cinnamon was “commanded” for less frivolous purposes by the Lord himself. In those times spices were most important in the making of ointments for the holiest of holies…… the ark of testimony. From EXODUS Chapter 30:22 to 26! and of sweet calamus two hundred and fifty shekels. And of cassia five hundred shekels………. It shall be a holy anointing oil. Cinnamon in those early times, 1000 BC, was also used for both cosmetics and embalming and throughout the ages it was a most coveted spice in the trading world. It was not used for cooking purposes until the Midle Ages when it reached its peak in Europe. In those days the meals were cooked in cauldrons that hung in the hearth. The meals slow-cooked in those cauldrons with flavors of sweet and sour, spices and herbs ended all in that one pot. When the Crusaders returned home and brought back sugar – even it was thrown into the cooking pot as well. Among the spices available Cinnamon was found to be the ideal spice that bridged the gap between the sweet and sour flavors. Picture yourself during those times when there were no utensils or plates to eat your meal. The food was served on slabs of stale bread called trenchers, and you had to pull a piece off with you fingers for a bite. Cinnamon or true cinnamon comes only from the island of Ceylon and the Malabar Coast of India. 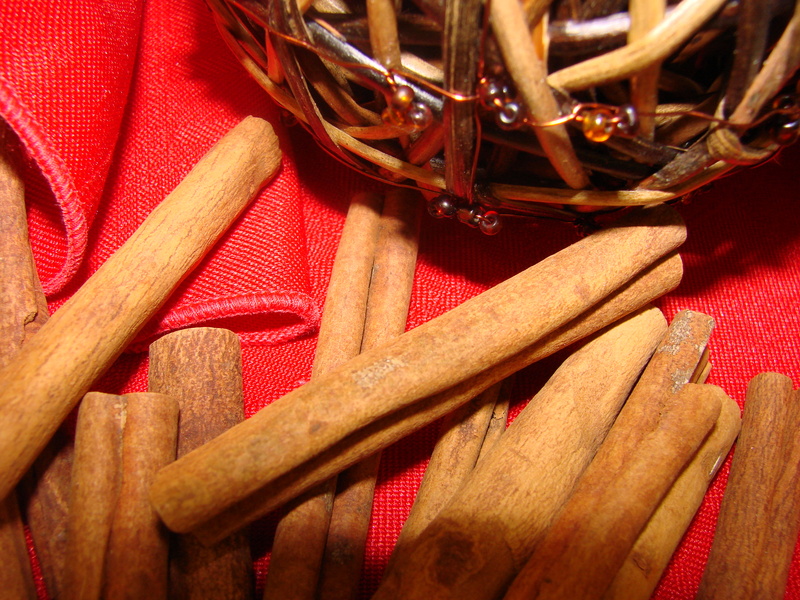 Another cinnamon is cassia cinnamon mostly used in the United States. Ceylon cinnamon is buff-colored and mildly sweet in flavor; cassia cinnamon is a dark, reddish brown color and has a more pungent bittersweet flavor. The inner bark of the Laurel Tree, a tropical evergreen, is the Cinnamon. The bark is harvested during the rainy season when it is more pliable. While it is laid out to dry it curls up into long quills. These quills are cut into certain lengths and sold as cinnamon sticks, or ground into powder. During the 18th century the cuisine of Europe changed drastically. The various flavors distinguished specific courses, and were cooked in separate pans or pots and eaten with cutlery and on plates. A new taste, not sweet or sour dominated the culinary scene: savory, PEPER, NOT cinnamon, became the prime spice of choice – as it is still today. At that time Cinnamon was used mainly for puddings or desserts where it is still the buffer between sweet and sour today. Apfel Strudel with its sweet sugar and sour apples would not be Strudel without Cinnamon. Austrians in particular use cinnamon very liberally in most of their fruit pastries, and since I am from Austrian heritage, even though I was born in Croatia, I too cannot live without CINNAMON, especially during the Holiday Season! Here is one of my favorite Recipes using Cinnamon! Use Filo – dough……..or you can pull your own! It is quicker however to buy it in the store. 3/4 cup pecans – chopped – or sliced almonds – DO NOT use walnuts….they darken and make the apples look unappetizing. 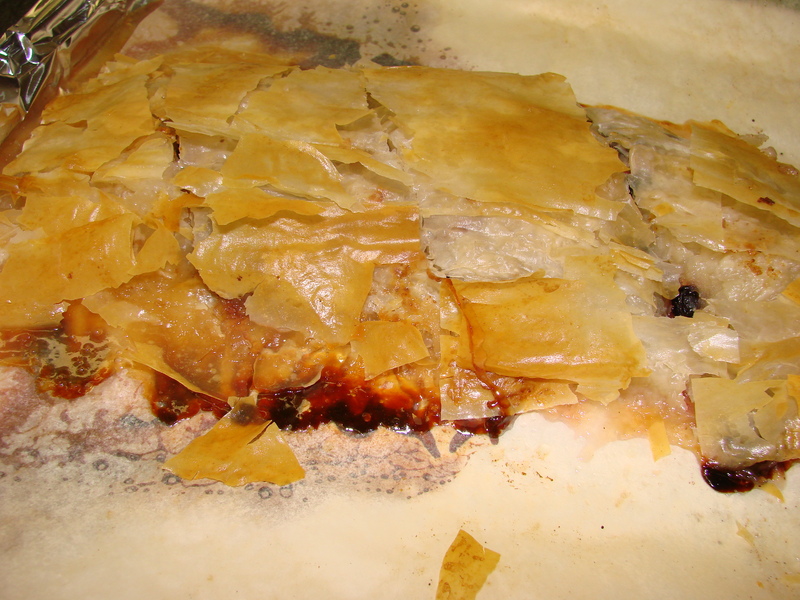 Place another sheet of Filo on top of the brushed sheet and brush with butter again…….continue to brush fife sheets of Filo before you start putting the filling on top of it. Place the heated and drained apples on top of the nuts and toasted breadcrumbs. 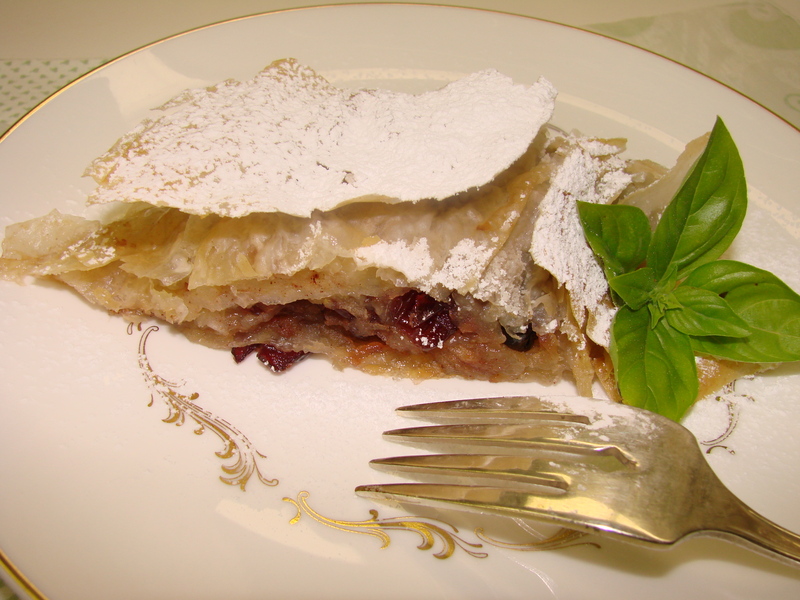 Bake the strudel at 350 F for about 35 to 45 minutes….or until the strudel is lightly browned. As soon as the strudel is baked and it comes out of the oven it needs to be cut into serving pieces. This is to allow the steam to escape……. which keeps the thin layers crisp. Maria, do you sprinkle the nuts and toasted breadcrumbs in between each layer of filo or only on top of the stack of five filo layers? Sheila………I usually sprinkle the toasted bread crumbs between 2 to 3 Filo Sheets………you can use more than 5 sheets of Filo…..if you wish. The nuts and the 1/2 cup of sugar I sprinkle on top of the apples. Strudel is easy and versatile……you can fill it with just about anything. 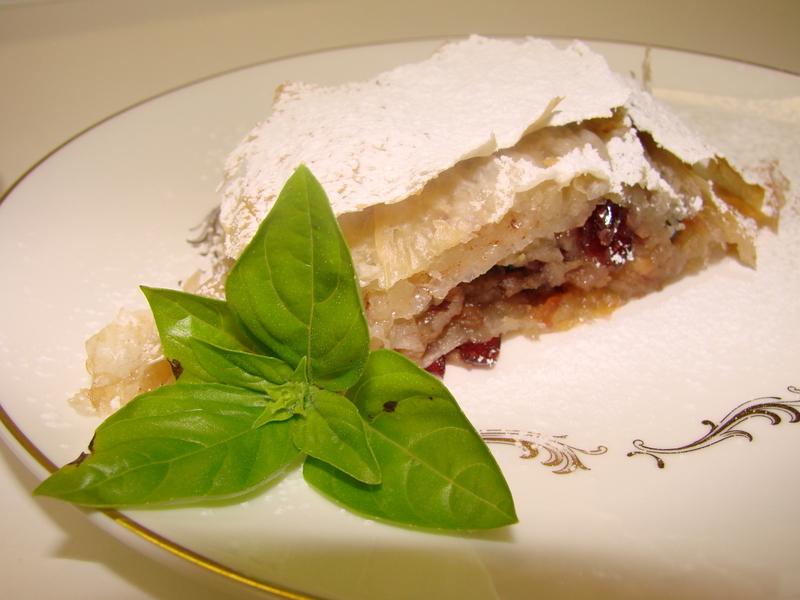 You can also fill it with savory fillings………one can be very creative with a strudel. By the way……children love helping with making a strudel…….it is almost like making a pizza and the endless possibilities…………….. Thanks for all the great info. Been using a lot of cinnamon this week myself. Lori has been complaining about how good everything smells because she doesn’t like making the hard decision about not eating it (that diet thing gets in the way….). I’ve about nailed down the cinnamon roll recipe I’m working on! Lovely! A Happy Thanksgiving to you as well. Hope to see you soon. Ja, Gruess Gott, sagen nur die Bayern und Oesterreicher; ein schoener Gruss. Hab Deinen Blog gelesen, die info ueber die Aepfel und das Apfelstrudel Rezept. Das naechste mal wenn ich Strudel mache werd ich dein Rezept ausprobieren. Wir in Bayern schneiden die Aepfel ganz duenn,und dann kommen sie auf den mit Sauerrahm ausgezogenen Teig, natuerlich mit Rosienen und Nuessen und Zimt und Rum. Ich mach immer meinen eigenen Teig. Vor ein paar Wochen schrieb ich an Dich und erzaehlte von Aepfeln, die wir im Garten hatten. Hast Du die Zeilen bekommen? Weil ich jetzt ganz allein wohne koch ich nicht mehr viel. Was ich immer noh gern tu ist das Lesen in Kochbuechern. Meine Mutter war keine gute Koechin. Ich musste mir alles selber beibringen. Sie konnte z. B. keinen Strudel oder Hefeteig machen. What a beautiful article. I felt that I experienced it with you. And………those smells coming from the kitchen! Yes, I can smell them as well. May you and your family be richly blessed this Thanksgiving and may the Holy Spirit infuse your home and soul with His love.